Fall In!! We'd love to hear your comments and thoughts on this tribute to Phil Silvers. Please feel free to leave a message. All you have to do is click the 'Add Comment' tab (above right)! It's that easy! The character of Sgt Bilko will always be a wonderful reminder of my late father, who died in 1961 at the age of 45. We would sit together and watch Phil Silvers and his crew (I was about 10) and laugh our socks off. I have remained a Bilko fan and an admirer of Phil Silvers. He was a one-off. Thanks for the memories Phil. Just wanted to let you fellas know that your efforts are appreciated. This is a fantastic site and I'm sure Phil Silvers would be thrilled! Many thanks. Mark. Phil Silvers as Bilko is one of TV's greatest comic creations. Isn't it such a shame that he's AWOL from our TV screens. Thanks for a marvellous site! Hey, guys! It just occured to me. I was thinking about that wonderful photo in your gallery of Phil and Lee Remmick (va va voom!) in the TV version of "Damn Yankees." Does anyone know if their are any copies of that broadcast available? I'd love to see it again! As an avid, life-long Phil Silvers fan I can't tell you what a joy it was to find your site! Fantastic tribute to the greatest comic who ever lived. Well done and keep up the fantastic work! A big thank you to all involved with this site. It's brilliant and what a tribute to the great Phil Silvers. I grew up watching Bilko in the 1950's and I can clearly recall sitting in front of an open fire, with my beans on toast watching Bilko and the gang! Oh the memories! Thank you once again! This is a fabulous tribute to Phil Silvers. Keep it up! As a Brit myself, who has spent the last 33 years working in HOLLYWOOD -I can honestly say that Phil Silvers was an absolute comedy genius. I remember watching the shows on the BBC in the late 50's and repeated all throughout the 60's, on Sunday afternoons. He had the timing, the charisma and the gift of banter, that made him totally unique. He was born for Sgt.Bilko, as was creator/writer Nat Hiken. The writing was so essential, but Silvers was the one who had to make it work along with the able ensemble of his platoon, Colonel Hall and others. As a frequent contributing writer to CINEMA RETRO, I feel I should write a tribute for our site. Particularly as we have so many fans who remember him from "It's A Mad, Mad, Mad, Mad World." Trust us Brits to keep remembering the greats! How'ar ya? Glad'ta see ya'! Seriously, folks, it's nice to find out that I'm not the only person who thinks that Phil Silvers was the single funniest clown in the history of TV. It's also gratifying to know that the love between Phil and you Brits was (and is) mutual. If you talk to Tracy Silvers or any of his daughters (didn't he have about six or seven of them? ), please tell her that Doug from Maryland says God bless her father. If there is anyone who brought more laughter and happiness to the world than Phil Silvers, I'm damned if I know! Keep up the good work! Having been a Bilko/Phil Silvers fan all my life it was a joy finding this site. Well done to all concerned for a fantastic job! Phil Silvers quick timing and great writing make this show a classic.Glad to see ya! As a kid I watched Bilko with my father! I'm happy to report I now watch Bilko (sadly only on DVD or video) with my own kids. I still enjoy it after all these years and the really wonderful part is... so do my kids! It would be wonderful to see the old Sarge back on TV! I thought I was the only fan, we are not alone! What a fantastic site. The Phil Silvers Show is as fresh today as it was over fifty years ago. Keep up the great work of keeping Phil Silvers where he belongs in the Comedy world - right at the very top. Great tribute to a wonderful comedian. ROLL CALL is a great feature....great to know about some of those wonderful people who co-starred with Phil. His family must be so proud of this site! Wow...what a site! Excellent work guys! I'm sure Phil Silvers would be proud of this. The care, attention and obvious love you put into this is phenomenal. Phil is still vastly underrated here in the US! One of our greatest comedians and performers in my book! Thank you guys for putting together a great tribute to Phil! I love the BPSAS site and what you have done to it. I check it out frequently. The collection is so wonderful, and it is always a joy to be there, look at the photos, read some of the Fort Baxter Journal. So what I really wanted to say with this message is that I greatly admire your work, and that I thank you for sharing all those wonderful bits, and pieces of your huge collection of a truly remarkable man, Phil Silvers. Leave it to the British to preserve the legacy of this American treasure. Who today has the talent and class to portray hucksterism with such charm and grace and that special curious warmth beneath the surface of that bombastic persona? Hooray for Phil Silvers and for this web site. Now go watch something with Phil Silvers in it right now. Preferably "Top Banana," the 1954 filming of his 1953 Broadway show, or the 1966 movie version of "A Funny Thing Happened On the Way to the Forum," which he very nearly steals from Zero Mostel (who played the star part Silvers initially turned down on Broadway but finally played in the 1974 revival), or a YouTube clip of Silvers doing a guest spot. Anything. Just do it. Up. Now. Go. Ho! Hee! Yah! A fantastic tribute to a true genius, who is sadly missed. This has to be the most extensive website devoted to Phil Silvers. Your research and attention to detail is astonishing and highly commended! Thanks for the regular updates - I'm logging in on a daily basis just in case I've missed something! Just enjoyed reading Roll Call on Elisabeth Fraser. Truly talented and gorgeous too! Keep up the excellent work - Phil deserves it! A great tribute to a brilliant comic! Phil Silvers would be delighted at what you fellas have done. One of the best sites on the web today! Keep up the great work.....and let's Bring Back Bilko! Used to love the shows when I was a kid. Marvellous tribute to a truly great comedian and gentleman. Good to know you guys are devoting the site to Phil's life and career. I especially enjoyed The New Phil Silvers Show feature - perhaps we'll see a similar one on Bilko some time soon? Keep up the good work - Phil deserves this tribute more than anyone else, everytime he graces the television he makes me smile! Thanks for you kind words Graham. Look out for a Bilko guide very soon! In the meantime track down a copy of the British magazine Primetime for a superb guide to Bilko published in 1983. Thanks for the happiness of over 50yrs of laughter you brought to us is beyond compare. R.I.P Phil Silvers, you will never be forgotten. Thanks for the chance to show my appreciation of a True Great Man. Thanks for the contact again Steve. You've done a wonderful job on the website and I'm sure that Phil's family will be thrilled too for the wonderful tribute you pay to him. I hope in due course I can help with the memorabilia that I have collected over the years and give other fans a chance to see some unique items. I still look fondly at the pictures we took at the ceremony on the Walk of Fame and it was one of those once in a lifetime experiences that can never be taken away. Keep in touch, and once again well done on an excellent piece of work !! Take a bow guys! What a site, Phil was a genius and this tribute has to be the best ever! Great coverage on The New Phil Silvers Show... and shame on the BBC for neglecting Bilko, the best ever American sitcom bar none! Phil left us all such a rich legacy, I bet his family are as proud as punch! Long-time Phil Silvers fan! This site is excellent. You fellas are doing a great job! Well done! Keep up the great work, Phil would be proud. Fantastic Site!! Well done on your research, great Memories & Pictures! Great site....fab tribute to a brilliant comedian and actor. Well done! Brilliant site! A great tribute to a wonderful comedian. Phil was the greatest of them all! This site is wonderful! Mr. Phil Silvers deserves it for sure! I love it! I really wish I would have had the opportunity to meet this beautiful legend, however, I am glad to be able to watch him on a nightly basis. He always makes me laugh. I do believe he was such an amazing man to be around, on or off the set. Thanks for dedicating and sharing this fantastic site, especially the photos! Great work guys! Take care! Sincerely, Lisa M. Evans. Once queued with my Dad at a theatre in Billingham to meet Phil. I was 16 and always remember Phil asking me if I liked the show. It was after meeting him that I found Bilko! 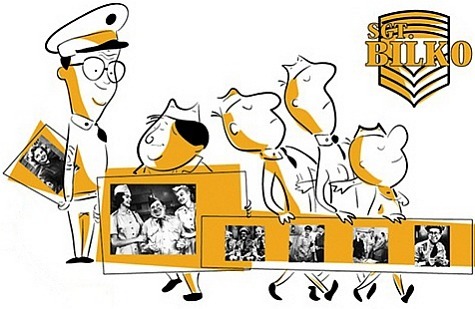 Thank you for a great site....a treasure trove of facts, info and pics on Phil Silvers! I used to watch Bilko as a boy. Had the pleasure of seeing Phil live in 1974 in FORUM. The site is wonderful and a great tribute to a brilliant comedian. Thank you. Thanks for a great site. Phil Silvers was the greatest! Phil Silvers was a genius. I wish the BBC would bring BILKO back. The site is excellent...well done! Well done guys! A great site...thanks for the Roll Call & Features sections...love the Gallery too! Thank you for a terrific website. A gem! Phil Silvers would be very proud of this! A great tribute to a brilliant comedian! Let\'s hope that we get to see Bilko back on TV soon! Met you fellas at the MEMORABILIA event in Birmingham this year and was bowled over by your enthusiasm! Steve, Mick... You\'ve done a fantastic tribute to Phil Silvers. Been aboard since the start way back in 1985 and I kept you both awake during that marathon 24 hour Bilko watch in 1989. Roll Call makes for fascinating reading and the icing on the cake would be to get Bilko back on British TV. He\'s sorely needed now more than ever! © The British PHIL SILVERS Appreciation Society 2009.